One size. Top edge 26” [66cm] , bottom edge 42” [107cm], height 15” [38cm]. In Iowa we have many bicycle trails that used to be railroads. 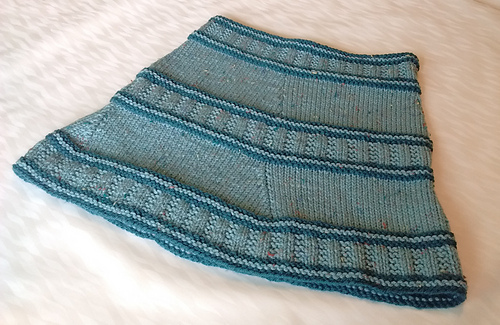 This garter rib reminds me of the rails that are no longer there. 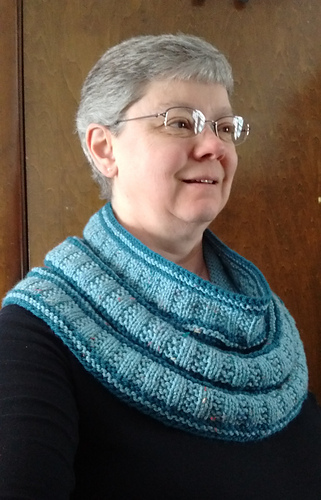 Starting at the lower edge with garter rib, the cowl transitions to stockinette and then alternates between the two. 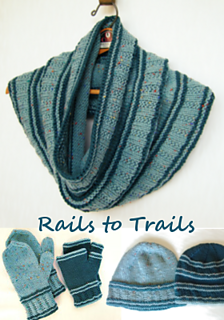 Decreases are made in the stockinette sections so the cowl will sit closer to the neck at the top for a comfortable fit. 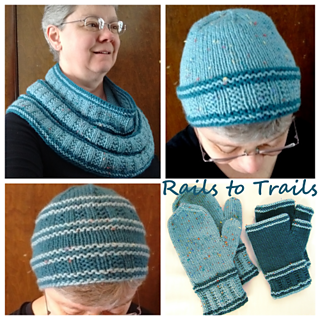 This is an easy knit and purl design which uses small amounts of contrast color - a great way to use up your leftovers. Think of the variations you can make! Main Color: 340 yds 311m, Contrast Color: 101 yds 92m. Photo Tutorial included for Old-Norwegian Cast-on. Thanks to my tech editor and test knitters for helping me make this pattern the best it can be.